Posted on Wed, Feb 29, 2012 : 8 a.m.
My fabulous blogging buddies Judee (Gluten-Free A-Z Blog) and Judy (Cranberry Morning) suggested feta cheese and basil pesto, respectively, as items they wanted me to use in creating an appetizer for my "Chopped" challenge, in which I had asked my blog readers to suggest ingredients that I would then have to use in creating something wonderful to eat. In addition to sharing a name, despite the spelling variation, they also both eat gluten-free diets. So I thought that this was a match made in cyber-Heaven and that I should unite my friends' items into one great dish! I didn't want to offer a recipe for pizza or noodles or anything that could contain gluten. Sure, there are breads and pastas which would accommodate this dietary restriction; but there are also so many, many foods without gluten that it seemed better to showcase them rather than to use substitutions. The ingredients I was challenged to use made my thoughts immediately travel to the Mediterranean. In Italy, it is customary to eat dishes in succession, with pasta or rice — a "primo piatto," or first course — served before the main meat dish. So a creamy risotto, enhanced with the vibrant flavor of pesto and the zesty addition of feta, sounded like the perfect antidote to a winter day. I must say, this dish is simply, richly and addictively delicious; I was so disappointed when I finished the last of it! And isn't flavor the most important ingredient in any dish? Heat the oil over medium heat in a medium saucepan. Add the rice and cook for 2 minutes, stirring to coat the rice in the oil. Heat the stock and the wine. Add the liquid to the saucepan in small increments, stirring the rice until the liquid is mostly absorbed and then adding a bit more liquid. When half of the liquid has been added, add the salt, pepper, Parmesan rind and pesto. Continue to add liquid to the rice, stirring constantly, until the liquid has been used up. Test the rice to make sure it is just tender; if it's a bit on the crunchy side still, add a bit more liquid and continue to stir. 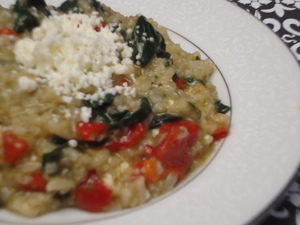 Once the liquid has been almost entirely absorbed and the rice is creamy, remove the Parmesan rind. Stir in the lemon zest, 3/4 of the feta, the red peppers, and the spinach; cook just until the spinach is wilted. Place onto small serving dishes and sprinkle the remaining Feta on top. Note: Buy hunks of good Parmesan cheese, and always save the rinds! With the last scraps of cheese on them that are beyond being grated, they add flavor and creaminess to risotto, to sauces and to soups. Wed, Feb 29, 2012 : 11:49 p.m.
Hmmm...sounds good. I will try it this week.